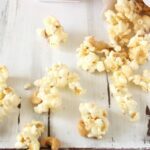 In a big bowl mix together popcorn and nuts. **tip** To get rid of kernels that didn't pop, pour bag of microwave popped corn into a brown bag and shake. Kernels will fall to the bottom of the bag. In a medium sauce pan on medium high heat, melt together butter, sugar, and corn syrup. Turn up heat if necessary and bring to a rapid bowl. Remove from heat and immediately pour over popcorn and nuts. Gently stir everything together until everything is completely coated. Pour out onto waxed paper or buttered pan and spread out to cool. Once cooled, break in to pieces. Store in airtight container or zip seal bags.